A couple years ago, I worked with a church in Ghana on a program to reach out to the Gonja and Dagomba peoples of northern Ghana. They constitute the two largest unevangelized people groups in Ghana, comprising 1.2 million speakers. 100 years of outreach to these people groups has so far had minimal impact. Identity is s good part of the reason. The Dagomba and Gonja have wolven identities for themselves that exclude them from Christian faith. Almost all of them follow another world religion and they believe that religion is part of their identity. Their ethnic identity and their religion are rolled onto one package. There are several facts that sustain this belief. Their rival people groups in southern Ghana are largely Christian while the Gonja and Dagomba are not. Before Christianity and other world religions came to Ghana, each group had its own variety of African traditional religion as most African peoples do. So it makes sense to them that each group has its own religion. The rival, largely Christian people groups of southern Ghana have started churches in the Dagomba and Gonja areas. But those churches were built for Christians from southern Ghana who have moved to the north for work. Those attending them are often civil servants posted to the north. The churches are lead by pastors from the Christian peoples of the South and they hold their services in the languages of the southern transplants, not in Gonja or Dagomba. So it appears that the churches are only for the southerners, and in fact, they are. The logical conclusion is that Christianity is also only for southerners. Furthermore, the churches in question sometimes don’t attempt evangelism or outreach to the Dagomba or Gonja people in whose communities they are situated. Ghana is not strange in this regard. I remember worshiping on Sunday evening in California with an entirely Anglo congregation located in a Hispanic neighborhood. I learned that the church had no service or outreach in Spanish. It is likely that the church’s neighbors considered Protestantism to be the religion of Anglos and Catholicism their religion. The behavior of the church certainly reinforced that perception, unintentionally I’m sure. So what’s happening in northern Ghana is not all that strange. In fact, I suspect that it happens in many places. Translating the Bible into Dagomba and Bimoba presents a radical challenge to people who link their ethnic identity to a particular religion. When the Dagomba or Gonja see the Bible in their language, and then churches with services in their language, attended by Dagomba or Gonja people, the idea that Christianity is not for them breaks down. But that can’t happen if the churches keep holding services only in the languages of southern Ghana. Translating the church’s liturgy into Gonja and Dagomba so that church services can be held in those languages. Translating training materials used to train lay ministers in the church so that Gonja and Dagomba Christians can be trained to lead services and perform other church functions. Recently, I talked to the Ghanaian man, Solomon Sule-Saa, with whom I designed the program. He was all smiles. It is working well, he said. The churches are growing. Incorporating their languages into the church is eroding the walls between Christianity and the Dagomba and Gonja peoples. The roots of this blog go way back, to well before I started writing it or even considered having a blog. I used to travel a lot for our ministry. When I would return home after a few days, and occasionally after a couple of weeks, my wife, Dayle, would ask me what happened. In typical husbandly fashion, I would compress it all into a couple of sentences, leaving out lots of the detail she wanted to hear. So she let me know that things had to change. So, I reluctantly started to take time, every evening when I was traveling, to quickly write down what happened during the day. It turned into a journal of my trip. This was in the days before computers and well before the Internet So the journal was hand-written in a small notebook. I would go over it with Dayle when I returned home from my trip. She loved it. But something happened I did not expect. First, in the evening when I was remembering what happened during the day, I would realize that something that happened, or something that was said, was important for my ministry. Perhaps a church leader had said that a translation was progressing too slowly, or a Christian in church would say that he or she was having trouble buying a translation in his languages because the sales point was always closed, or far away. Then I began so see patterns. For example, over time I found that several Church leaders had mentioned in passing that a translation was going too slow – each speaking about a different translation. I realized that I had been missing these patterns and forgetting important things that were said. So in addition to writing my journal to Dayle, I started writing a paragraph or two about what I had noticed, a bit of analysis of it and perhaps further actions to take, such as gathering more information. That started guiding my conversations with translators, local people and church leaders. The result was rich in insights. When blogs became a thing, I started putting my reflections online. And that has turned into this blog. I realized in the process that God really is in the still small voice. He is not pushy. But he does reveal Himself. We just have to take the time to reflect, be quiet and listen. My way of being quiet and listening is to stop and write a little journal. The things God is revealing almost pop off the page at me. Much of the Bible was written in an farming society. The parables of Jesus include many word pictures from the farming practices of his day. The parable of the sower is probably the best known, but there are many others. All of those listening to Jesus would have been well aware of the practices he was referring to, because they were all around. But 80% of Americans live in cities. Even in American agricultural belts more than 3/4 live in cities. So Jesus word pictures based on farming are distant. We may understand them or not. Even when we understand them, they don’t grab us. On the other hand, just over half of the people of Ghana live in cities. But even those have close ties to rural communities. They may have moved to a city after spending the childhood in a farming community, or they may visit, or there may be farming communities very close to the city. They may buy most of their food in a market where the produce comes from nearby farms. When we lived in Ouagadougou, a capital city, the woman next door would winnow grain in her yard; people planted millet, sorghum and maize in vacant lots. So people see traditional farming even in the cities. For them, Jesus’ farming parables are not just understandable, they are vivid. 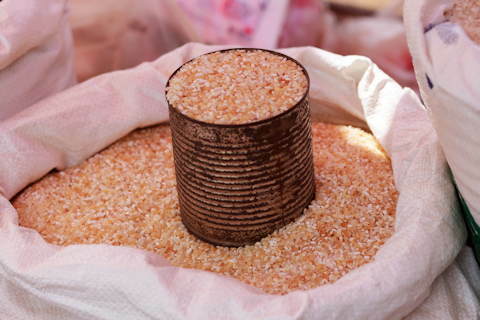 One part of many African markets is full of grain crops: rice, millet, maize, sorghum, etc. In traditional markets, the grain is in bags, one of which the seller opens so that buyers can see the quality. On top of grain is a tin. It is full to overflowing with whatever grain is in the sack. The grain is priced by the tin. When you buy it, the seller shakes down and heaps on more gain till the tin is overflowing and then pours the heaping tin into whatever container you brought, maybe even adding a handful for good measure. No “level’ measures here! When we give, God will give back even more, like stuffing as many fries as one can into the holder so that they spill out in the bag or onto your lap and get lost in the gaps between your car seats. The way you treat others will be the way God treats you. Are we stuffing or are we stingy? Programs to Translate the Bible generate information about those programs. One of the aha moments in my missionary career came when I thought about where that information goes and where it doesn’t and why. To raise funds to support the missionary and his/her work. To generate prayer for the missionary and the people they are serving. To recruit others to serve in Bible translation. The information is intended for people and churches in the place the missionary came from. Very little, if any, of the communication is distributed in the language community where the missionary works, or to Christians or churches in the country where the missionary is works. Today, most Bible translation programs are conducted without a missionary. Instead, nationals do the translation but often with funding coming from churches and Christians in another country. These translation programs also produce information. Reports photographs and prayer requests are sent to those providing the funding. Here’s an example. As with missionary translations very little, if any, of the information is distributed to churches or Christians in the area or at the national level, even where discretion is not needed. So people in the country can feel that they don’t know anything about the program being carried out in their midst. This means that churches and Christians are not mobilized to support the translation program through prayer, giving or serving. It might also mean that when the translation is printed fewer people read or use it. This was the situation when I first came to Ghana in 2011. 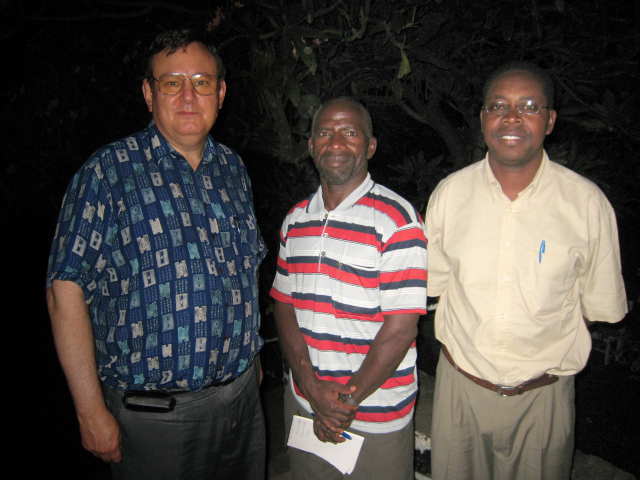 But the new director had a vision for mobilizing churches and christians in Ghana in support of Bible translation. Dayle and I played a supporting role in that vision. Today, most denominations in Ghana are well aware of translation efforts and many give significant gifts out of their annual budget for translation. Out of the effort to make Ghanaians fully aware of translation came a group of Christian business men who now support translation. Also, now GILLBT (the Ghanaian organisation I work with) has Ghanaian staff who make sure that information about translation is made known in Ghana. So we only get involved in that occasionally.